I love mozzarella sticks. 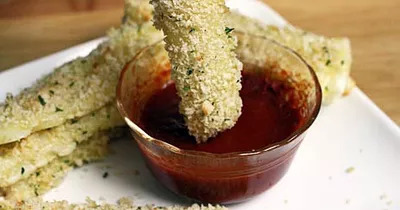 Dipped into some warm marinara sauce, it can be such a comforting appetizer or snack. The only problem is that often when you order these at a restaurant, they come loaded with fat and calories. So this week I took to the kitchen to create a version that would be lower in both but just as delicious! I used this Fried Cheese Sticks recipe and made the following tweaks to retain all the taste and flavor of the classic but with much less fat. The above substitutions worked out really well! I was pleased with how crispy the sticks came out being baked not fried, and the flavor didn’t suffer without the full fat cheese one bit. These are perfect as a quick afternoon snack or finger foods to serve when entertaining.